Now some Councils want to take over parenting roles…. The madness of power grabbing of Councils never fail to amaze and entertain…. are they becoming out of line with service delivery – another rate rise excuse for new community services in policing this potential by-law? Tannah and Hayley enjoy Skinners Adventure Playground in South Melbourne. JUNK food has been banned from an inner Melbourne playground. 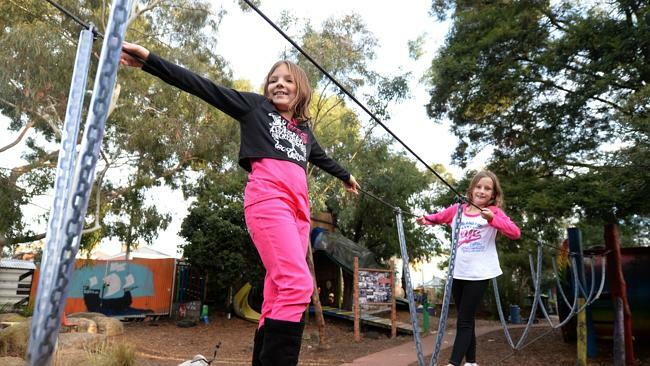 The local council has declared South Melbourne’s Skinners Adventure Playground a “junk food-free zone”, advising children to leave chips, chocolate and sugary drinks outside. The City of Port Phillip says allowing junk food to be eaten in the park would undermine the message of its healthful eating programs. But a leading child psychologist says the council could be “shooting itself in the foot” by discouraging children from spending time outdoors. “All sweet, fatty or fast food or drink is banned from the playground and must be consumed before entering. If you would like your food or drink put away for you whilst in the playground, please see a staff member,” a message on the council’s website reads. Port Phillip Mayor Amanda Stevens said that the “junk food-free zone” was not intended to punish children who wanted to eat treats, but to complement council’s healthful eating initiatives for disadvantaged families living in nearby public housing. These included a breakfast program for schoolchildren and a Friday night community meal, which were of benefit to about 130 local children, Cr Stevens said. Free fruit and vegetables are also handed out at the park. The Mayor said “nine out of 10” visitors were happy to comply with the ban. “Occasionally someone’s not happy. But we have about 50 other playgrounds in Port Phillip where you can eat what you want,” she said. Child psychologist Michael Carr-Gregg said parents, not authorities, should be pushing their children to eat well, and a blanket ban may discourage children from using the park and getting exercise outdoors. “That defeats the purpose,” Dr Carr-Gregg said. Dimity Gannon, of food and fitness advocacy group the Parents’ Jury, said parents needed these sorts of initiatives to support their own efforts and she would like to see other playgrounds follow suit.